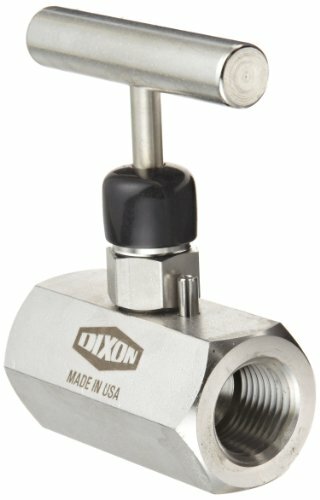 Mini needle valve. T design handle style. A viton o-ring seal and a teflon back-up ring below the threads protects the mini valve from corrosion and galling. The stem threads are rolled for strength and ease of operation. The metal-to-metal hard seat design is 100 percent helium leak tested to 1 x 10-4 ml/s at 200 psi on each mini valve. Orifice size: 0.187", flow coefficient: 0.44. Size: 1/2" - 14 NPT female x 1/2" - 14 NPT female.